The hook is this: like the photo, share it, then visit a website to enter a contest for a free Disney World vacation. 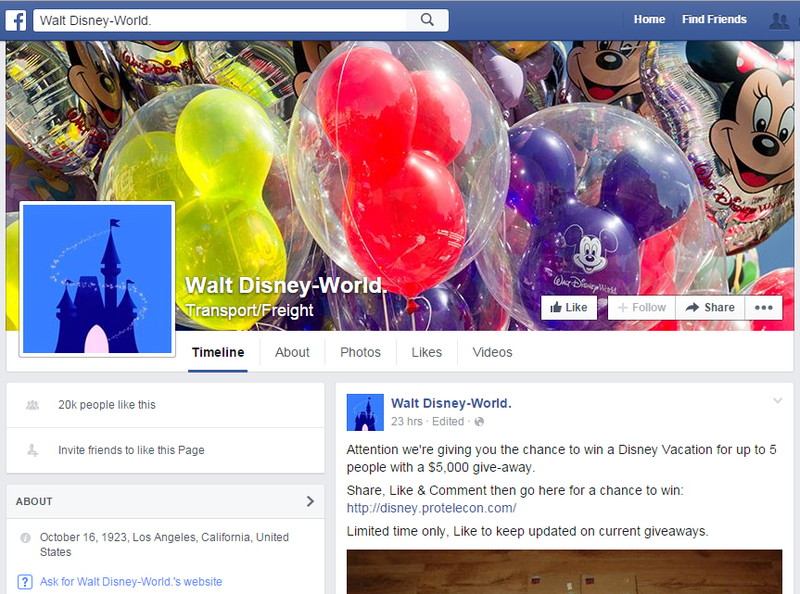 Here’s the problem: the Facebook page this image resides on is NOT the official Disney World page. It is an impostor designed to trick users into liking the page. Once enough people have done so, the page content will be changed to push other scams into the news feeds of the people who liked the Disney page. Now, why am I such a downer? Why am I trying so hard to make people sad? How do I know it’s a fake Disney page? Notice the lack of the blue “Verified Page” checkmark next to the name. Do you think for one moment that a company the size of Disney would have ITS OWN NAME written incorrectly on its own Facebook page? Look at any official Disney website or product. Do you see “Walt Disney-World.” anywhere? Do you see Walt Disney World train cars and semi trailers all over America’s railroad tracks and roadways, delivering jars of pickle relish and car parts and textiles? No? That’s because Disney World is a theme park, not a transportation and freight business. 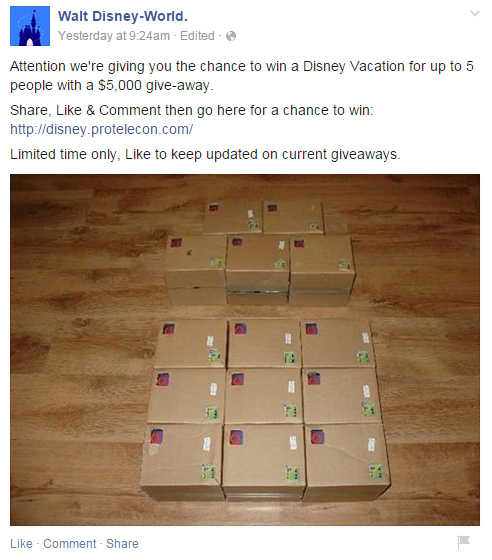 Do you believe Disney World’s official Facebook page would have 20,000 likes (as of today) and ONE lousy post? And no link to the official Disney World website? These, and a dozen other points, are your free ticket to knowing that this Facebook page and offer are a scam. I don’t Facebook much anymore, but I’ve always lived by an “If it’s being shared a lot on Facebook, it’s probably not true” code. It’s a pretty accurate rule, and the stuff that IS true you’ll hear from credible sources eventually anyway. Several times a month, I hear about a new scam making the Facebook rounds. Inevitably, they all seem to involve the same pattern: this company is giving away a free gift card (or item) to everyone on Facebook if they like this page! I don’t always write a new article about it because I would just end up with a template; “There’s a new scam on Facebook, claiming that ____ is giving away $_____ gift cards for liking a page. Don’t do it.” I’d rather just talk about the principle than rehash the specifics every single time. For one thing, think about the numbers: Ikea is giving away $1,000 gift cards to everyone on Facebook? There are 800 million people on Facebook. That means their budget for this one promotion would be $800 billion. Ikea’s profits in 2010 were “only” 2.7 billion. Heck, the entire GDP of Sweden was $338 billion last year. A free gift card in any amount, or a free trendy high-tech device, from any retailer in the entire Universe, including all possible parallel Universes and/or dimensions, from now until the very end of Time itself (and in all future incarnations thereof if it turns out Time is cyclical and is repeated on a Cosmic infinite loop of some kind), ever, just for “liking” page on Facebook. This includes if you find yourself in a whimsical land of magic and wonder after chasing a white rabbit down a hole, or after hiding in a wardrobe and ending up in a forest and being greeted by the Faun Tumnus. That last one is a little more general. The point is: these are scams. They always have been, and they always will be. Don’t “like” the pages, don’t even visit the pages. If you’ve got friends who keep falling for this stuff, tell them it’s a scam. Every single time if you have to. A little public shaming can go a long way. Note: for maximum atmosphere, first scroll to the bottom of this post and play the YouTube video, and listen to the music while you read. The night meowed at the window of the dingy third-floor office on the wrong side of town like a housecat left out in the rain, trying to draw my gaze from the hand of solitaire laid out on the desk between half-empty cups of cold coffee, old newspapers and an ashtray spilling over with stale butts. I glanced at the window and shuddered for some reason, then wondered who left all the spent Chesterfields there, seeing as how I don’t smoke. They made a good prop, though, so I returned to my cards. If I could just find the other red queen, I was set. It was the kind of night that slithers through the gutters and alleyways, around garbage cans and dumpsters, up fire escapes and into the ventilation. It always finds a way in, always creeps up behind you, always gets you in the end. There was a knock at the door, and a woman entered. She was one sad-luck dame by the look of her, all switchblade sadness and razor gloom, whatever that means. She was carrying a laptop computer (which seemed anachronistic given the setting, but this was the Fraud Prevention Unit, and these newfangled bean-counters were the rule these days). “Oh. I…oh.” She swayed on the spot, as if trying to decide something. “C’mon, spill it, sister,” I spat. She placed the laptop on the desk and hit the power button. It took a minute to start up, and the awkwardness hung in the air like burnt toast. “So…um…read any good books lately?” I started to say, but the machine was ready. “This one right here,” she said, and I read the email. “Did you click on anything in this mess?” I said. “If I was you, lady, I’d drill it with my heater,” I spat. I nodded thanks as she disappeared out the door and went back to my game. Black eight to red nine. The card underneath was the queen of diamonds. 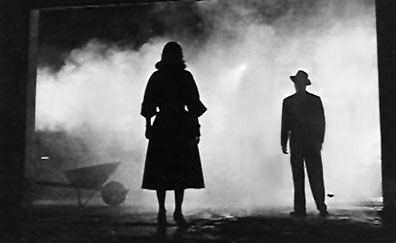 “There’s my lady,” I murmured over the lonesome wail of a siren echoing across the night. 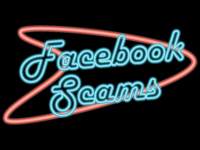 Facebook scams involving pop culture icons are nothing new. How many people clicked on a link promising a video of Justin Bieber behaving badly, only to end up on a bogus survey site and spread the disease to all their friends when the malicious site forced them to “like” the video (sight unseen because there was no video) to proceed? At some point, the victim is asked to reveal their phone number, which causes about $30 worth of premium-rate services to show up on their phone bill. There was another one that promised advance movie tickets to one of the Harry Potter sequels. Same deal: bogus survey site. Now there’s one that promises tickets to a Twilight sequel that isn’t even coming out for over a year. Betcha can’t guess what it leads to. Think about who these con artists are targeting. They’re not targeting me. I don’t care how Justin Bieber is behaving. I’m a cranky music nerd in my mid-30s; I already suspect Bieber of evil just by the mere fact that his music exists (although if you slow it down 800%, it’s absolutely gorgeous—is this what it sounds like to 11 year old girls?). Who are the people, by gender and age, who really care about the next Twilight move? Are these people “heavy” or “rare” Facebook users? Do they tend to have cellular phones or not? It’s a perfect storm; if they only snag 1% of teenage girls who use Facebook, are into Twilight and have cell phones, that’s about fifty gazillion scam victims right there. At $30 per fraudulent cell phone charge, we’re talking some serious coin. The key is to somehow get your kids to understand what a Facebook scam looks like. What’s okay to click on? What’s not? How do you impress upon them to never, ever give out their phone number (or other personal information) to a website? Facebook recently (and finally) released a guide to using the site safely. You can download it here: Own Your Space: A Facebook Guide to Security. I applaud the company for, at long last, finally admitting that their site is not totally safe to just blindly click on everything that shows up on your page. The guide claims to be “For Young Adults, Parents and Educators,” but I doubt many teens are going to read anything that begins with the sentence, “If there was any doubt on the incredible power of social networking, consider the more than one billion pieces of content shared each day with over half a billion users.” I’m about to fall asleep just pasting that, and I have a degree in English Literature; long, dull treatises were a daily encounter at one point in my life . No, this thing was written for adults, and there’s some really good information within. Download it and read it yourself, then talk to your kids. I suppose the best way to really learn the ropes is to join the site yourself, but at the very least, talk to them about security on a regular basis. And make sure they know there are no free movie tickets. If you click on it, it tells you to paste a line of code into the URL field…you know what? I’m not even going to go into it. Suffice it to say that it perpetuates the scam. Here’s the thing: there is no way to see who has viewed your Facebook profile. There’s never going to BE a way to see who has viewed your Facebook profile. OMG! I KNOW, RIGHT?! If you see a wall post claiming to link to an application or website that shows you who has viewed your profile, don’t even stop to wonder if it’s real. It’s not. It never has been, and it never will be. You also don’t NEED to see that, no, your ex is totally NOT “creeping” your profile “every hour,” because he actually couldn’t care less what you’re up to anymore. Just enjoy the (more than a little conceited) assumption that he’s pining for you, unable to sleep or eat, scrawling tortured poetry in a black notebook under a bare 40-watt light bulb. If that’s what it takes to get you through the day. If you’re still worried about who is looking at your profile, set it to “private” already. If you’re still still worried about who is looking at your profile, click the little X in the upper right corner of the screen (or wherever the X is on a Mac), shut down the computer completely and stand up. Put on some shoes. Now, walk out the front door of your house and look around. Go for a run. Or a walk. Or drive to the library. Call someone on the phone and talk. Arrange to meet and do something together. Repeat daily until you no longer care who is looking at your Facebook profile. I’ve been on the fence about social networking lately. To what extent does it allow us to connect, reconnect and share, and to what extent does it give far too many third parties access to our personal lives? And when I say “social networking,” let’s have it out in the open: that means Facebook. I mean, it’s possible to overshare on Twitter, but most tweets amount to inane babble that doesn’t reveal much about anything. It’s possible to overshare on MySpace, but that would require people to still be using MySpace when, in general, they’re not. It’s all about the Facebook these days. Sure, Facebook can be fun. You can find people you haven’t seen in years. Share photos. Make flippant remarks about everything (this is mostly what I do there). But I think the company is cocky sometimes. They have been guilty of assuming that, just because you want to share a photo with your friends, you automatically want to share it with literally every single person (and company) with an Internet connection. I also heard they were predicting 750 million, then 1 billion, users before too long, after they hit 500 million. Sorry. It isn’t going to happen. Facebook has been the king for a few years, but if there’s one rule on the Internet, it’s that nothing lasts forever. Unless you’re Google, apparently. I digress. If you still want to use Facebook rather than be an early un-adopter and delete your account, I think it’s okay to do so, but you have to keep a few things in mind. You can’t just click everything that shows up on your screen. Check your privacy settings every now and then. The safest method is to set everything on “Friends Only.” That mostly locks other people out, as far as viewing your photos and reading what you post. Whenever Facebook introduces a new feature, new layout, or other big changes, it’s a good idea to re-check your privacy settings. In the past, “new look” usually meant “we changed all your settings back to the default, which is everybody in the universe can see everything you post.” A major update just came out, or is about to; I can’t even tell anymore. At any rate, check your settings regularly, just to make sure. Here’s the short version: just don’t do it. Farmville. Mafia Wars. Happy Aquarium. Farm Wars. Happy Mafia. Whatever. Just avoid them. Plus, these games are just a massive waste of time. You can’t tell me those hours wouldn’t be better spent away from your computer. It’s not all just apps and games on Facebook, either. There are always a million things showing up in your friends’ status feeds, often with accompanying links. Here’s your first rule: there is no app that will tell you who has viewed your profile. It doesn’t exist. There are, however, scams that use this promise to give crooks access to your profile. Here’s another one: any combination of words like “OMG,” “this really works,” “five things,” or scandalous videos depicting a celebrity currently huge with teenagers (Justin Beiber is the soup du jour), is not going to lead you to what it says it will lead you to. It’s called “likejacking,” and I’ve written about it before. One more: your friend is not stranded in London, having been mugged. Someone has hacked his account and is trying to get you to wire money overseas. Basically, if you’re using Facebook for anything beyond connecting with friends, you’re opening your information up to third parties. Some of them just want to advertise to you. Others want to steal from you. Okay, it’s probably okay to “like” your favorite band’s official page in order to stay updated on new releases and tour dates. And it was funny when that pickle got more fans than Nickelback. But, really, is all of this necessary? My goal would be to spend less time on Facebook, not more. I started using the Internet in 1995, and I’ll be honest: I’ve gained some weight over those 15 years. I can’t help but wonder if I’d be more fit now if I’d done more face-to-face social networking, and less BBQ-potato-chip-to-face social networking while sitting in front of a computer screen. You have to love the Internet. It used to take years for new words to be coined and gain popular usage. Over the last decade and a half or so, as Internet usage has evolved from something only nerds do to most people’s primary source of information, new words are coined and take off within days. Podcast. Lifehacking. Likejacking. Likejacking is a recent term that is really just a Facebook-specific form of clickjacking that involves tricking users into following a link to a website, usually to obtain some form of content (usually video). However, the content doesn’t get delivered at all. The user clicks on what appears to be a video player within the website, but there is no player. There is, however, a hidden link that causes the page to show up on the user’s Facebook status (i.e. “Joe Blow likes FIVE REASONS YOU SHOULD NEVER USE A CELLPHONE AGAIN”). Joe’s friends see this update, wonder what Joe now knows that they don’t, and they get roped in. Meanwhile, Joe Blow is being redirected some sort of bogus survey site or other shady website. It’s usually a ploy by dishonest people to abuse online affiliate programs—trick a bunch of people to click on your pay-per-click ads and rake in a nice chunk of money. The way I understand the likejacking process is this: on the malicious website, you have something that looks like an embedded video player, but is actually just a JPG image of one. This object is set up to be “transparent,” i.e. you can’t act on it by clicking, so even though you can see it, to your computer it’s not there at all. However, if a different object (such as a Facebook “like” link) is hidden underneath the JPG, when you click on what you think is a video player’s “play” button, you’re actually clicking the “like” link hidden below it. Now that I typed those spaces in there, all I can think of is Mad Libs. Let’s see…a noun and a verb. Okay, DUCK and SMILE. “Once you see this duck, you won’t ever smile again!” Yeah! Comedy gold! How’s that for timing? The thirteenth installment of Ridiculous Spam Friday falls on an actual Friday the 13th. I love it when a plan comes together. Your email address won £850,000.00 GBP in this month NATIONAL LOTTERY E-mail online drew. I removed the email address under “From” because it is apparently the legitimate address of an administrator for a school district out in California. Where do spammers get the legit addresses from? At any rate, since it’s just another lottery scam message, you don’t even have to wonder why a school admin would be telling you about a lottery, since you already know it’s a scam. The incredulous punctuation in the subject line (“!!! ?”) is cute, though. And how, pray tell, would an application on Facebook (I thought Zoosk was its own site) be trying to find me at my work email address? That’s not the one I use there. This one serves as a good reminder: never click the “unsubscribe” link in a spam message. All you’re doing is confirming that your address is good. I wonder what happens if you write to the P.O. Box, though. I’d imagine putting your email address, full name and home address into the hands of these people could be even worse. Ten bucks says that P.O. Box is just a drop site that is set up to forward everything to Russia. I bought a laptop from a website: www.laosm.info/ Last week, i have got the product, its quality is very good and the price is competitive. They also sell phones, TV, psp, motor and so on, by the way, they import products from Korea and sell new and original products, they have good reputation and have many good feedbacks. If you need these products, look at this website will be a clever choice. I am sure you will get many surprise and benefits. Hello! This one came from a person I work with, although from their personal email address. Somehow it was used to forward this message to every one of her contacts. Greetings! She’s perfectly capable of using coherent English, so I could tell right away something was fishy. I’m sure you’d get all kinds of “surprise” if you tried to follow that link and actually purchase electronics, and there’d be absolutely nowhere to give them any negative “feedbacks.” Hello! Greetings!